The vaquita is the smallest living cetacean, weighing up to 55 kg (120 lb). It resembles the common porpoise. The main body color is gray, darker above than below and also around the eyes and mouth. There is a dark stripe from the chin to the base of the flipper. The vaquita lives in shallow lagoons along the shoreline where there is strong tidal mixing and high productivity of the aquatic plant and animal communities. The vaquita appears to be a non-selective feeder on small bottom-dwelling fish and squid. It swims and feeds in a leisurely manner, but it is elusive and will avoid boats of any kind. High-frequency clicks are used for echolocation. The vaquita occurs singly or in small groups, usually from 1 - 3 individuals but as many as 8 - 10. 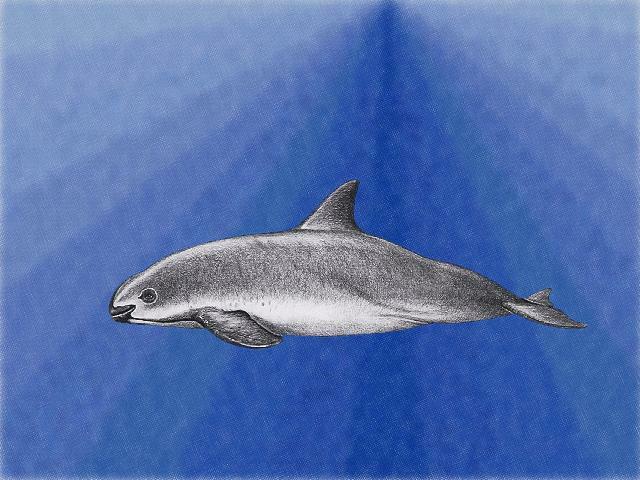 The vaquita may have formerly occurred in Mexico throughout the Gulf of California. It was considered abundant in the early 20th century. As of the early 1980's, the only recent records of its occurrence were from the northern part of the Gulf of California. Currently it has the most limited distribution of any marine cetacean. It is restricted to the northwestern corner of the Gulf of California. The vaquita declined in conjunction with the intensification and modernization of commercial fisheries, starting in the 1940's. Currently, the fisheries aimed at a variety of species are intensive in the upper Gulf of California, and the incidental trapping and drowning of vaquitas, particularly in gill and trawl nets, is their principal threat. In addition, the vaquita's habitat has been drastically altered by damming of the Colorado River in the USA. Long-term changes due to the reduced freshwater input are matters of concern. However, the immediate priority is to eliminate the bycatch of vaquitas in fishing gear. *** The vaquita is one of the world's rarest mammals, and it has the most limited distribution of any cetacean. *** The vaquita was first documented by science in 1958. *** The vaquita is the smallest porpoise in the world. Length: Females - up to 1.5 m (5'); males - up to 1.4 m (4.6'). Weight: up to 55 kg (120 lb). Females may become sexually mature at a length of approximately 1.3 m (4.4'). The gestation period is probably 10 - 11 months (Culik 2003) . Births are thought to occur generally around late March or early April. A female probably produces 1 calf annually. A vaquita calf is weaned after several months (Burnie & Wilson 2001) . The maximum observed age is 21 years (Culik 2003) .